Miso Crafty Knits: Knits In Progress: Socks, Socks, Socks!! Knits In Progress: Socks, Socks, Socks!! The other day as I was rushing around the house getting ready to leave, it dawned on me that I had nothing to knit!! Ok, ok...before you all jump on me, let me explain. I had to take the Kiddo to one of his appointments and it required me to stick around. Since waiting was involved it's only natural that I would want to bring my knitting along. The thing is, all my projects were at stages that required more attention and brain power than I would like to give to my knitting while hanging out in a waiting room. The only socks I had on the go at the time were my Ulti.knit Socks and while they're easy peasy, they garner way too much attention and a lot of comments from non-crafters. I like to sit and knit in peace, not have people come up to me to tell me that I'm "crocheting wrong" or that my "string is snagged" on my "artsy brooch" - which is actually my ghetto makeshift knitting pin of an open plastic locking stitch marker threaded through a safety pin (this is what a real knitting pin looks like). All my sweater WIPs need stitches picked up for a sleeve and I don't know about you, but for me that involves counting, a handful of stitch markers, and some thought about how to pick up all the required stitches. My Missoni-Inspired Blanket would have been the perfect mindless knit but it's just way too bulky and big to shove into my handbag. Plus, I would need to bring a long a few balls of yarn if I wanted to knit more than just one stripe. Although, I should point out that each row takes me approximately ten minutes to either knit or purl, so technically even if I had brought along one ball of yarn that only needed a two-row stripe, that's twenty minutes right there. And yes, I'm a knit nerd and I like to time myself throughout a project - usually the larger ones. And I always want to see what I'm faster at: knitting using my usual method or purling Portuguese style. Anyhoo, what's a knitter to do when they don't have a small mindless project to tote around when running errands? 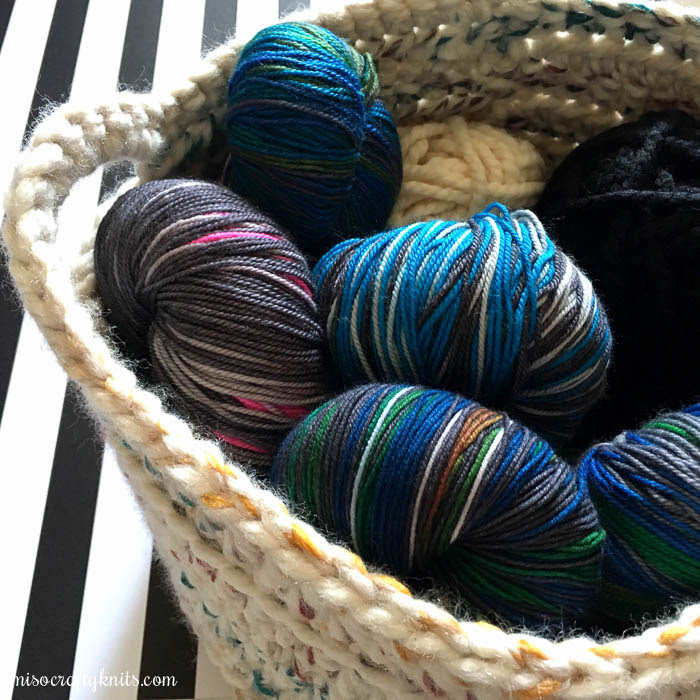 If you guessed wind ALLLL the yarns you've ever planned on knitting socks with, you're right!! I grabbed an armload of skeins and went to town with my ball winder, and the past few days I've felt like a distracted dog (SQUIRREL!!) by casting on at least four different projects. In my defence, two of those projects are gift knitting. So do they really count?? But I'm happy to report that I now have a pair of self-striping plain vanilla toe-up socks (I'm using yarn by Caterpillargreen Yarns in a gorgeous limited edition colourway made for the Fibrations event that happened back in August), and another pair of Spree Socks (again using more Sunshine Yarns Merino Worsted) on the needles. I did cast on Pixel Rise but started to second guess my choice of colour for the toe/heel/cuff. I'm very surprised that I don't have any grey yarn suitable for socks in my stash. It's taking every ounce of my being to not go to my LYS and pick some up. Don't worry...I'm sure I'll come up with something. I tried to take some photos of these new WIPs but they all looked...messed up. Maybe it's the extremely poor lighting in my living room due to the grey rainy day we're having today, or maybe it's because I can never get little tiny knitted triangles on teeny tiny needles look both pleasing to the eye and artsy. Just trust when I say they're looking good. What's on your needles this WIP Wednesday? PS: In case you're wondering, I did bring along the blanket to my Kiddo's appointment. I managed to knit up an eight-row stripe before it was time to go home. How lucky these recipients will be when gifted with your handknit socks. I told myself I'd finish my scarf first before casting on something new for me. I already have a pattern lined up for NaKniSweMo. There will be a Space sock KAL for November also with the Pinfeathers and Purls and Cherry Purls Podcasts. I had wanted to join but wanted to knit contrast cuffs, heels, and toes and I don't have any yarn to do that. I was going to cast on then my Frankenfreet yarn from The Cozy Knitter but it's should I wait til I finish my color-tipped scarf or no?